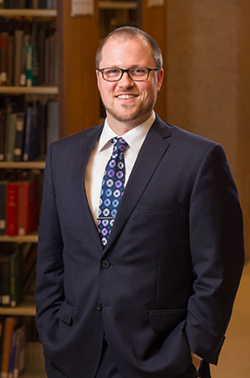 Jeffrey Gonda, assistant professor of history at the Maxwell School, was honored by the Supreme Court Historical Society with the Hughes-Gossett Award for Best Journal Article. Gonda was presented the award by Supreme Court Justice Antonin Scalia during a ceremony earlier this summer. The award was for Gonda’s paper “Litigating Racial Justice at the Grassroots: The Shelley Family, Black Realtors and Shelley v. Kraemer (1948).” His article tells the story of J.D. and Ethel Lee Shelley, an African-American couple who bought a house in 1945 in St. Louis. However, unknown to them, the home was under a racial restrictive covenant that prohibited African Americans and other minorities from occupying the property. Another local homeowner quickly sued the Shelleys to prevent the family from keeping the home, but in 1948, the Supreme Court ruled in favor of the Shelley family and rendered all racially restrictive covenants unenforceable on the grounds that they violated the 14th Amendment of the U.S. Constitution. Gonda’s paper details the background of the Shelley family, the role of local black realtors in their fight for equality and the unique aspects of this landmark case. For winning the Hughes-Gossett Award, Gonda received a cash prize and an engraved block of marble that was once part of the Supreme Court chamber. Gonda was also interviewed by the Supreme Court Historical Society, a private nonprofit organization dedicated to the collection and preservation of the history of the Supreme Court.